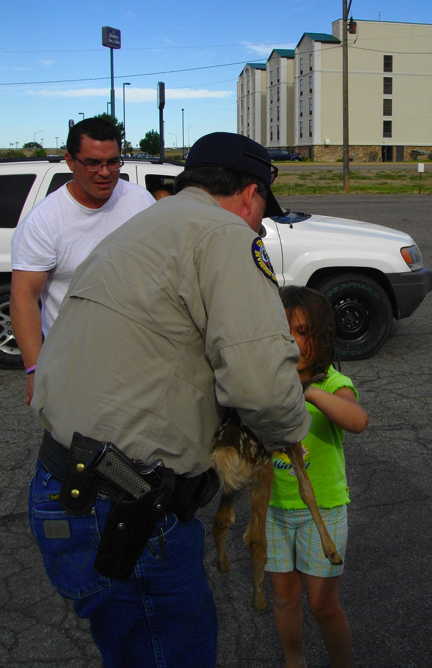 Some time on the morning of Thursday, June 24, a mule deer doe was struck by a car in the western San Luis Valley. 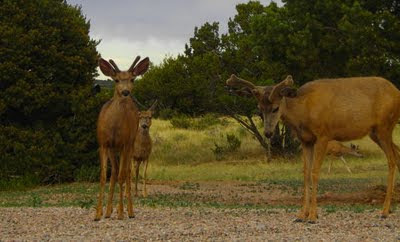 Mule deer give birth in the early summer, and this one was pregnant with triplets. 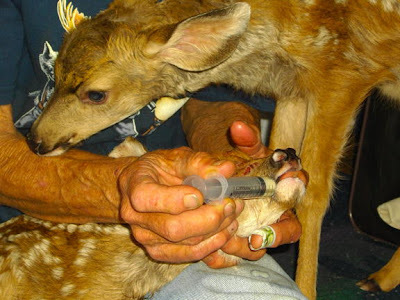 A wildlife officer rescued the two surviving fawns—a roadside Caesarean section may have been necessary—I don't have the details. Then they faced a nearly 200-mile trip to a wildlife rehabilitator, which is where M. and I got involved. We got the call early in the afternoon to see if we could bring them the last 35 miles, and I took a few snaps. LEFT: When we were transferring the fawns in Pueblo, this guy spots us, pulls up, and wants his daughter to see them, so district wildlife manager Brent Woodward had to shift into educational mode. A vet in Monte Vista had given them colostrum and lactated Ringer's solution, but the smaller fawn was clearly weaker. The larger fawn, having taken some goat's milk from a bottle, is exploring her new situation. The smaller one would not suckle right away, so he is getting some milk from a syringe. The rehabilitators' home is in perfect foothills mule deer habitat, and a lot of deer hang around—some are offspring of former "patients." Two bucks in velvet were watching as we brought in the fawns. These fawns joined nine others at the rehabilitators'. If they survive, they will be released out the gate onto the adjacent national forest. It seems to be a pattern that many of the females like to come back and give birth in the oak brush near the house, however.